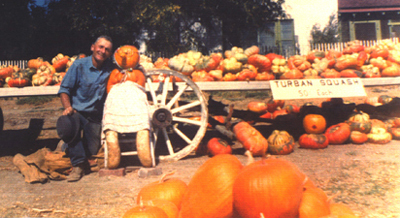 Miles Barlogio (born September 30th, 1898) was the first in our family to plant pumpkins along the fertile banks of Jack Creek west of Templeton and Paso Robles in rural San Luis Obispo County. We are continuing the family tradition of growing and selling produce directly from our farm to your table. 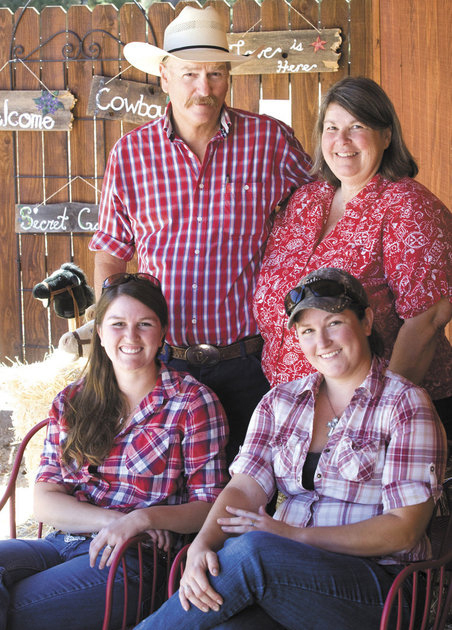 On the Central California Coast, it is almost impossible in today's market to make a living growing dry-land hay, grain and cattle as past generations of Barlogio's have. Based on Great-Grandpa's earlier successes with pumpkin farming, we have been exploring furthering that concept by diversifying, planting more row-crops and committing more ground to the orchard and farm market project. Our family values, our way of life, and our Christian beliefs have a deep rooted faith in God. What is important to us is working together as a family, and creating a future; so the next generation and generations beyond will be able to preserve our land and continue our family tradition of farming. Our goal is to create a successful business that can support our children, and down the line their children, while preserving the land around us. We hope in the process to be able to educate our visitors about the importance of farming and its contribution to our community. Supporting local farmers not only results in better tasting and healthier food; it helps to grow a vibrant local economy and preserves open space and the rural character we all cherish. 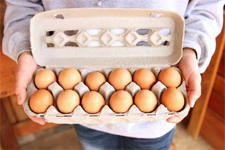 We believe in sustainable agriculture. 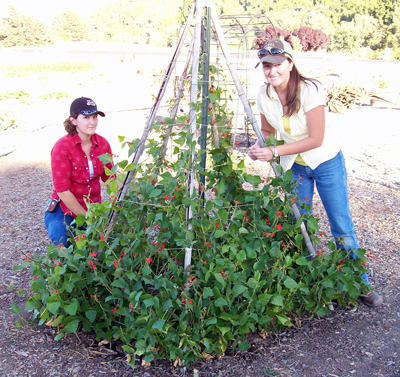 We use natural based sprays, we plant untreated seeds, and we employ organic methods of pest control whenever possible. An example is, we use sunflowers planted around our pumpkin fields as a lure crop to attract those pesky cucumber beetles away from our pumpkins and squash. 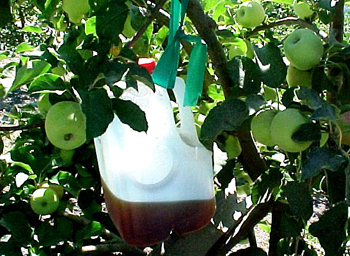 We rinse old milk jugs, cut a hole near the top and fill them with a mixture of molasses and apple cider vinegar. These make a great natural coddling moth trap! We use dormant and summer oils as opposed to insecticides, and we use mineral oil for corn earworms. We use nitrogen fixing cover crops like vetch and clover as a natural fertilizer. We are building owl houses and hawk perches to encourage larger predator bird populations for mice and gopher control. When it comes to the actual farm operation we don't hire any outside help and do all of the work ourselves. 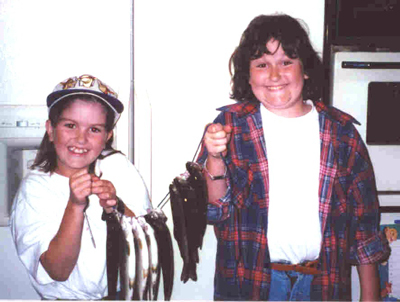 We couldn't do it without our two daughters Becky and Mandy. They actively help in every aspect of the operation. From choosing seed and new varieties to plant next year, planting bare roots, pruning trees, painting trunks, staking, hoeing, mowing, harvesting, collecting eggs, caring for the farm animals ... whew! ... every aspect! It is a never ending year-round project, and we couldn't do it without them. We are truly a "Family Farm" and we feel blessed to work together doing something we love. Mandy helping Dad repair a tractor . 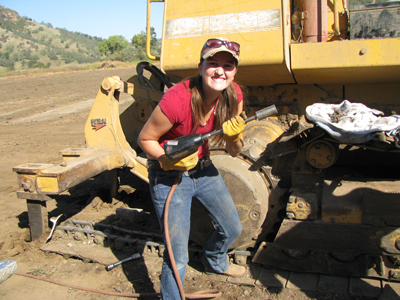 . . watch out for girls with power tools! Becky greeting guests on Halloween Day . . . Howdy Y'all! We rotate the crops on different areas of the farm, so one year you might see safflower (used for oil) growing in the adjoining field, other years it might be oat hay, seed oats, wheat or barley. This year oat hay is growing in the field east of us, wheat behind us and vetch further north. 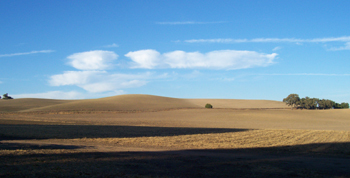 The far hills are planted in barley that you can see waving in the breeze. Portions of the field are summer fallowed (farm lingo for allowed to rest). The front pumpkin field is annually planted with a cover crop of vetch and barley. It will be worked into the soil before we plant pumpkins in early June. The orchards and row crops have to be planted in areas closer to our house or the farm store which both have deer fencing. Only a few acres are fenced for this purpose, allowing the native wildlife to continue to utilize 98% of the farm. In the past we planted the creek fields you see to the west of us with pumpkins, as Grandpa did in the 1950s through the 1960s. They do well there as they love the rich loamy soil. Unfortunately deer adore pumpkins, and will eat every morsel, leaving only the woody stem. As the deer have become more prolific, and developed a fondness for those tasty orange meals, we've had to move the pumpkin and squash project back to the house and protected area adjacent to the farm store. Deer don't bother Indian corn or gourds, so we still have some options open to us. It depends though upon the amount of rainfall we've had and the moisture content in the soil. Currently we have nearly 600 fruit trees on the farm, the majority of which are old fashioned heirloom varieties. 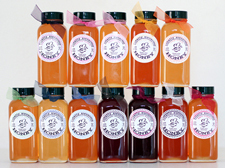 We offer u-pick for peaches, plums and apples. We also have u-pick blackberry and olallieberry patches. In the summer we grow a number of garden vegetables including sweet onions, elephant and traditional garlic. This year look for over 40 different varieties of heirloom tomatoes. What a taste treat! All of our produce is allowed to vine ripen. After eating a vine-ripened tomato you will never want to go back to store bought again. In the fall we gear up for our main harvest of the year. Pumpkins, pumpkins and more pumpkins! Fortunately for us, with our unique micro-climate here on the Central Coast, we can grow awesome pumpkins. We are planting over 60 different varieties this year to ensure that we have the perfect pumpkin for you. 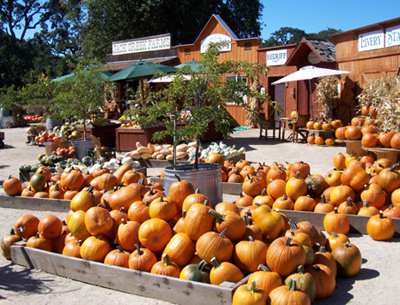 We'll have sugar pie pumpkins for pie making, jack-o-lantern type for carving, huge 100 pound plus pumpkins, tiny pumpkins, heirloom Cinderella pumpkins, orange, yellow, green, cream and white pumpkins. We even have striped pumpkins! Pick your own in the field from the vine, or choose from those already picked and displayed at the stand. 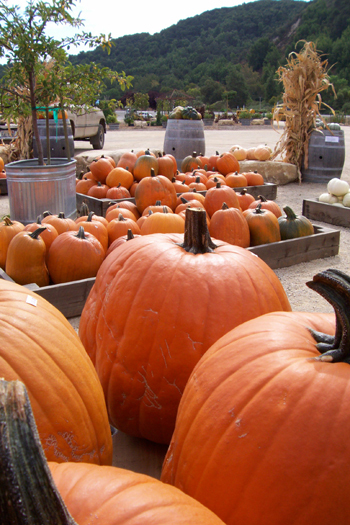 We are confident when it comes to selection, we have more varieties than any other pumpkin patch on the Central Coast! 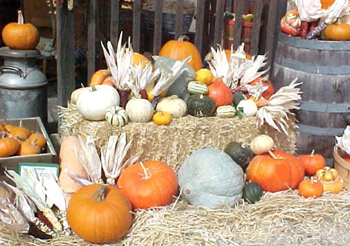 Add to that 40 different varieties of baking winter squash (lots of traditional heirloom and specialty varieties ... the kind Grandma used to bake), Indian corn (both large and small), wheat sheaves, corn shocks, a multitude of decorative gourds and straw bales. We grow everything you need for fall entertaining and decorating. Our belief in God runs deep, and as a Christian Family we have chosen to emphasize a Harvest theme in lieu of traditional Halloween celebrations. We enjoy taking time to answer any questions you may have about storing, drying or preparing any of the produce we grow. We are happy to share favorite family recipes, including Great-grandma's Squash Pie recipe, Nani's Apple Crisp and my sister Janie's award winning to die for Backyard Apple Tree Cake. Check our recipe page for these recipes as well as many others. Great-Grandpa James Barlogio first immigrated from Switzerland in 1889. He settled in San Luis Obispo County, in Green Valley near Harmony, California where he was a founding member of the Harmony Valley Creamery. The family raised and milked dairy cows and grew beans as well as hay to feed the cattle. While there, son Miles was born in 1898. They flourished and eventully purchased property with the two-story Victorian house you see directly behind the town of Harmony. It is still owned by the family today, where fifth and sixth generations of Barlogios live. Miles continued the family tradition of dairying and farming. After Miles married Great-Grandma Helen Couchman he settled on this side of the hill, as the slightly drier/warmer climate eased his arthritis. He also found therapeutic the sulfur hot springs and mud baths in Paso Robles. Miles had two children - David and Milene. David, born in 1934, still lives in the farmhouse where he grew up. Grandson Tim (my husband) was born in 1956 and lives on the farm near David and Milene. 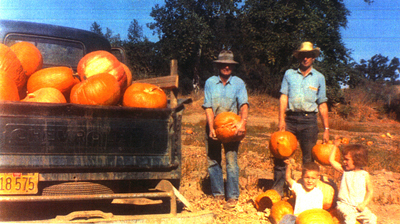 In the late 1950s is when the pumpkin legacy began. Miles was the first in our family to plant pumpkins along the fertile banks of Jack Creek on the Templeton side of the farm. 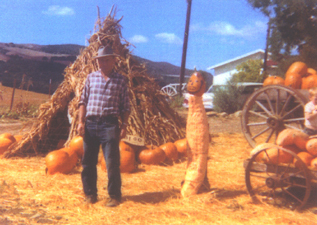 He opened his roadside stand in 1960 and offered pumpkins for sale to the public. His stand was known as the "Barlogio Pumpkin Center" and was located on what was then called York Mountain Road. We still have the original sign that is nearly 50 years old. 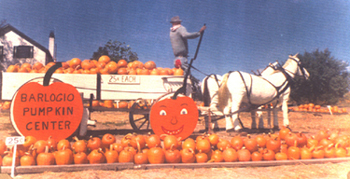 If you look carefully you will see that the pumpkins on the wagon and in the foreground sold for 25 cents each!!! This photo shows the roadside stand in its early days. The little shed you see was an "honor-system" stand. 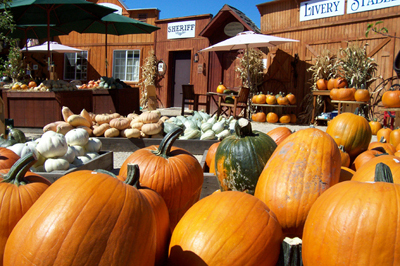 Customers would choose their pumpkin, weigh it on the provided scale, and place their money in a quart jar. Customers were responsible to weigh, make their own change and carry their purchases to their cars. 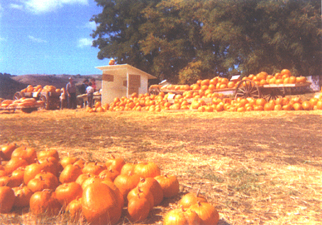 The pumpkins above were grown along the banks of Jack Creek in Templeton. Pictured in the photo are Grandpa Miles, David, Tim (6 yrs old) and his sister, Cindy. Harvesting was a family affair. Each year Grandpa added a new attraction for customers to enjoy. 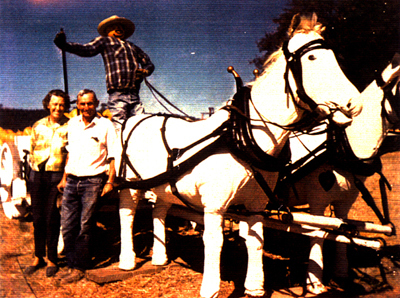 Miles and Helen are shown with their life-size homemade horses. These horses were made using old mattresses, straw, burlap, canvas and wood. The horses are wearing a full set of real leather team harnesses. They were used in the farm's fall display and were placed in front of an antique freight wagon filled with pumpkins (and sometimes kids!). This photo was taken in 1969. The picture above shows a Pumpkin Center (they called the pumpkin patch the Barlogio Pumpkin Center) visitor favorite - Pumpkin Granny. She was made from a large misshapen pumpkin. Her legs are made from pink banana squash and her nose is a gourd. She is wearing one of Grandma's old aprons and scarf. Behind her is a display of turban squash. Grandma made turban squash into a family meal. She would hollow out the center, fill it with a meatloaf mixture, and bake it in the oven. Tim remembers it as being very tasty. Granny's shape changed from year to year, and each fall she came back to welcome visitors to the pumpkin patch and gourd garden. This is a photo of Miles with Pumpkin Granny. Those large turban squash are only 50 cents each. This photo show Miles in front of a teepee made from corn stalks. It was a favorite of the visiting children. It had a 3-foot-tall little homemade boy inside appropriately dressed as an Indian. Next to him is a large pink banana squash that measured nearly 4 feet tall. They placed a head on the squash and painted it like a man's face. 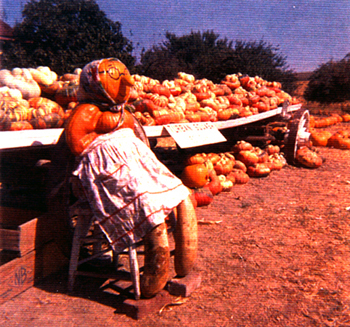 Milene painted the roadside stand's signs and was the artist responsible for the painted pumpkin and gourd figures. This photo was taken in 1965. It shows Miles Barlogio standing on an old Cat 30 Crawler. 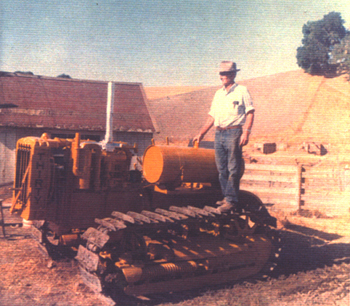 He bought this tractor brand new in Paso Robles in 1932. It stills runs and is used on the farm today. It will be on display at our farm store during the month of September. In 1969 the State of California exercised imminent domain and condemned the land in the center of the farm. They wanted the land to build a new highway, State Highway 46 West. York Mountain Road was narrow and windy, and they wanted to provide passage straight through the mountains all the way to Highway 1. Grandpa did not want to sell, especially at the price they offered, however he had no choice. He was very disheartened. The new highway would effectively divide the farm in half, with the best bottom land now on either side of the highway. What was one big field was now two smaller fields. The fertile soil along Jack Creek was now covered in fill dirt, blacktop and a new cement bridge with rip rap. It was hard to move the many pieces of equipment across the highway to farm both sides of the road. He eventually sold the farm land to the south in the early 70s. 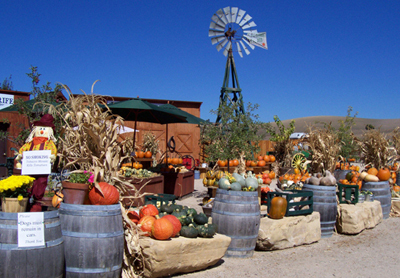 Miles tried to continue the honor-system pumpkin farm. Visitors didn't want to make the detour on the old York Mountain Road, and went whizzing by on the new wider straight road that bypassed the farm house. York Mountain Road was now severed by the new highway in several places. It was confusing to give directions to the farm. Grandpa moved the honor-system stand down to the "new" highway. Only now the stand couldn't be observed closely from the house. The road brought new people to the area, but sadly also brought theft problems. He made the decision to close the stand. In the years that followed the portion of York Mountain Road that the farm was on was renamed Jack Creek Road after the creek that ran through the center of the farm and under the new highway. Grandson Tim always fondly remembers following Grandpa in the creek fields and helping to plant pumpkin seed by hand. Grandpa would carefully pull a bit of soil away with a hoe, Tim would drop a seed in the shallow trough, and then Grandpa would pull the dirt back over it. Then he would step on it "just so" - to compact the soil and moisture around the seed. In the early 1990s Tim and I were exploring ways to supplement our farm income, and we decided to re-open the roadside stand. The highway had more and more traffic, and the local wine industry was bringing many tourists to the area. 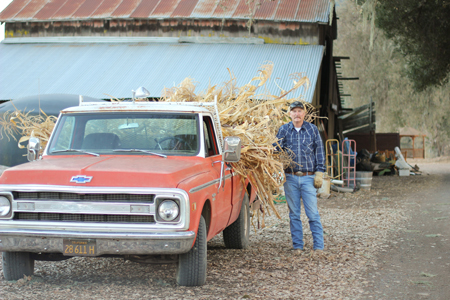 Below is a photo of Tim with "Red" our faithful farm pickup. Above is a photo of our roadside stand taken in 1996. Continuing the family tradition, each year we have added new crops and activities to our farm . . . just like Grandpa did! Our stand now includes a small health department certified kitchen which we use to bake treats made from apples, pumpkins, wheat, walnuts, olallieberries, and eggs all grown on our farm. 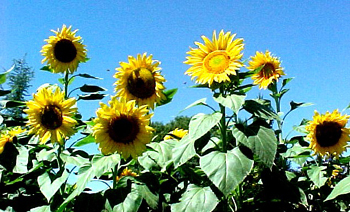 Current farm activities include u-pick berries, flowers and vegetables. Farm animals are on site. 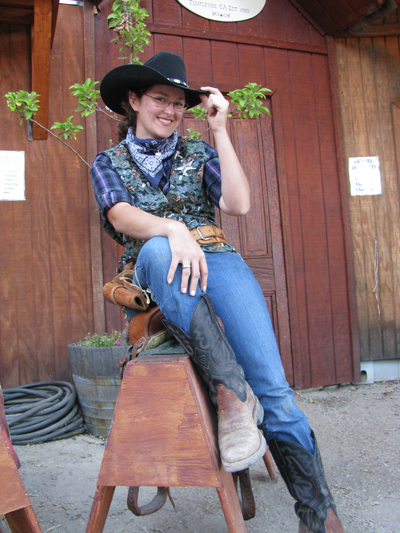 Visitors can try roping a dummy steer or sit on a real saddle on a sawhorse "horse". Kids can try their hand pumping water the old-fashioned way, or climb on a haystack. Guests will enjoy the gardens, and the many pieces of antique farm equipment on display. There are lots of backdrops for great photo opportunities too! Watch for other new activities as our farm continues to grow. Thank you for the opportunity to share our farm story and our farm history with you. We are located just west of Templeton and Paso Robles in San Luis Obispo (SLO) County, on the beautiful Central California Coast. Have you ever wondered what the story was behind the sweet peas growing on the hillsides of Highway 46 West between Highway 101 and Highway 1? Let’s step back in time a bit and start at the beginning. Miles Barlogio was born in 1898 in Green Valley (a tiny community just north of Harmony, CA). His entire life Miles enjoyed growing things, and he shared his harvests with his friends and neighbors. One of his many projects was to raise sweet peas from seed. He loved the fragrant mounds of color he grew in his yard, and he decided to plant some nearer to the road so those traveling by his west Templeton farm could enjoy them too. He planted sweet peas on a section of Jack Creek Road near his house. It was common to see folks pulled over alongside the road, picking large bouquets of the fragrant flowers and taking them home to enjoy. Others stopped and took pictures and enjoyed the heady fragrance. Miles was frequently seen along the roadside hoeing weeds and tending to the plants. If asked by those passing by if it was okay to pick them he never hesitated to say “yes”. Miles decided he wanted more people to enjoy his flowers. He drove the length of Highway 46 West planting seeds on the hillsides as high as he could throw them. The following spring the peas bloomed. He was concerned that the peas weren’t high enough on the banks to spread and re-seed, and the lower ones down were being mowed and sprayed by the highway maintenance crew. His grandson Tim (my husband) came up with an idea to build a seed planter using compressed air. It would utilize the same principle that sand blasters incorporated. While Tim got busy designing and building, Miles got busy growing more sweet peas for more seed. They had a plan, now he needed a LOT of seed. He would place mounds of dried sweet pea vines on a tarp in his driveway, fold the tarp over and drive back and forth over the pods to thresh the seeds loose. He carefully picked them out and saved them until he had nearly a 5-gallon bucket full of the tiny round seeds. That following spring the sweet peas were a sight to behold. Vibrant shades of reds, purples, pinks, and white sweet peas greeted everyone who traveled the corridor. Miles passed away in 1986, yet his legacy lives on today. There aren’t as many colors of peas as there used to be, and the dry weather of the past few years has taken its toll. Even so scented mounds of sweet peas persist in bursting from the ground every spring and remain a tribute to Miles’ fondness for generosity and sharing. They are a reminder of a gentle man whose greatest joy was in bringing joy to others. Content for this area will be posted soon!